A digital print from Xiao Han’s exhibit entitled “School Scene 2” (Xiao Han, 2015). Xiao Han is an emerging artist who graduated from TRU before moving to the prairies to finish her master’s degree in fine arts. Hew new exhibit is a series of large-scale photographs depicting relationships, the family unit, the female gender and Chinese political issues. Han graduated from TRU with a bachelor’s degree in fine arts, and with an interest in China’s one-child policy. “At that time, I just wanted to have a topic that really related to me and that I could talk about. I believe artists always have to say something,” Han said. Han went on to do her masters at the University of Saskatchewan and continued with the topic, focusing more on the politics and the female gender. “I grew up in a family with one child and my mom had a second pregnancy and had to abort,” Han said. The exhibit works to give people an emotional understanding of what it was like growing up in a one-child family and with other political unrest. 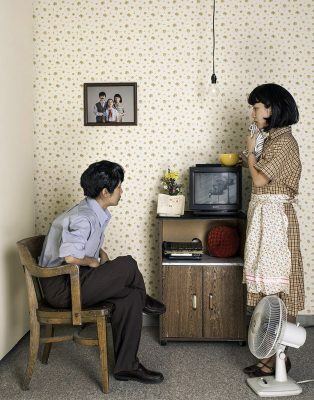 A digital print from Xiao Han’s exhibit entitled “Family Dinnertime” (Xiao Han, 2014). “I want them to understand me as someone who grew up in this culture – what I’ve been through,” Han said. Han says that she hides subtle details in her work to remind people in her culture and others of the Tiananmen Square protests in 1989. “There is something blurry in the photos, and that is how I remember my childhood. When you are in the society of one child, everyone is one child. So, you don’t think it’s strange until I come out to Canada and realise people around me have siblings and all I have is cousins. And people talk about ‘tank man’ and all I know is something chaotic happened,” Han said. Han hopes that her exhibit will evoke a question in the new generation and get people to start thinking about change. “I keep telling my friend, if one day I’m in trouble that means I’m famous,” Han said. “The One” will run at the Arnica Artist Run Centre until Feb. 18.